A custom glass table is a piece of art, and should be treated as such. With the proper care, your custom glass table will shine like new for years to come. Whether you use it to entertain guests in your formal dining room, or add a hint of elegance to your entryway, here are easy tips you can use to keep your custom glass table in the best possible shape. Why choose a custom glass table? Like the name suggests, a custom glass table is made unique for you and your home. Custom glass tables can be fabricated in any shape and size, and used in any room. Their customizable nature ensures that your room will have a table that’s exactly fit for its size, instead of relying on prebuilt tables that may be too big or too small for the space. Most often, custom glass tables are used as centerpieces in formal dining rooms. 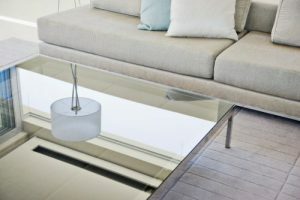 However, a custom glass table adds a unique design element to any room. As a bonus, if carefully maintained, your custom glass table can become a family heirloom that will be passed down for generation after generation to enjoy its craftsmanship. When it comes to scratches, prevention is an easier course of action than repairs. To keep your glass table clear and scratch-free, there are several precautions you should take. You should never place items on your table that could scratch it—such as toys, books, and any other items with sharp edges or a rough and textured base. Plates, bowls, and silverware can also cause scratches, and should be set on placemats. Sometimes, even when you’re careful, scratches can still happen. For a permanent fix, it’s best to contact a professional. The good news is, minor scratches can be remedied by using household items as a temporary fix. Clear nail polish can cover and disguise scratches by filling in the scratched area. Clean the area around the scratch with a glass cleaner, and then use the nail polish applicator to carefully apply a thin layer of polish to the scratch. Allow the polish to dry, then use a damp cloth to remove any excess polish. Toothpaste isn’t just good for polishing your teeth—it can also help polish glass. Dab a small amount of non-gel toothpaste onto the scratch and gently use a damp cloth to rub it across the surface. Make sure to rub the toothpaste softly to avoid causing more scratches. Wash away the rest of the toothpaste and clean the glass for a finishing touch. Creating a paste of baking soda and water can be an effective way to remove scratches from glass. In a small bowl, mix one ½ cup of baking soda with a few tablespoons of water. Once you’ve made a paste, use a cloth to rub it around the scratched area. Then, clean the glass and assess if the scratch is still noticeable. This method may take a few repeated attempts for the scratch to be completely removed or become less visible. Protect the investment you made in your custom glass table by cleaning it properly. Abrasive cleaners containing ingredients such as ammonia and acids should not be used, as they can damage the glass. Additionally, you should avoid wiping your table with paper towels. Paper towels can leave behind unsightly lint on the surface of the glass. These pieces of lint can cause scratches, and are also hard to remove. You should dust your table on a weekly basis at least, using a microfiber cloth or feather duster to avoid allowing dust, dirt, and debris to settle on the surface of the glass. If your table is in a high traffic area, it’s not likely to accumulate too much dust. However, for tables in rooms that are rarely used, such as formal dining rooms, it’s important to keep up your dusting schedule because dust can scratch the surface of your table over time. Looking for a safe and budget-friendly way to clean your custom glass table – there’s an easy method using ingredients you likely already have on hand. Mix ¼ cup of white vinegar with one cup of water and apply it directly to the glass using a soft microfiber cloth. Newspaper can also be used instead of a microfiber cloth to give your glass a streak-free shine without the danger of scratches or dullness. For tough stains or especially dirty surfaces, you can add a ½ cup of rubbing alcohol to the cleaning solution. It’s likely your table is going to encounter several hazards, like hot mugs, hot plates, sharp silverware. You can keep your table safe by always using placemats, hot pads, and trivets to ensure that nothing comes in contact with the surface of your table. For added protection, consider a stylish table runner or table cloth. Rubber bumpers can prevent damage to your glass that could result from accidental bumps or drops. Rubber bumpers are pieces of rubber with anti-skid properties that prevent the tabletop from sliding or falling off. They are especially useful if you decide to do some redecorating and need to move the table. Rubber bumpers are applied on the base of your table to secure the tabletop. Rubber bumpers aren’t noticeable and don’t detract from the beauty of the table, while still providing safety and security. Whether you’re looking to design a glass table, or maintain the one you have, there’s no better place to turn than the glass experts at True View. It takes experience, dedication, and great customer service to bring your glass ideas to life—and you’ll find all three at True View. Our dedicated technicians cut glass with precision and accuracy, using polishing equipment and their own two hands to polish the glass until it’s smooth and radiant. Then, the table is carefully placed in the room of your choice. Throughout the whole process, you’ll be able to rest easy knowing that True View will be on the job from beginning to end. Get started with a free over-the-phone quote today.